So it is time again for an update to Core Temp: here I will go over the new additions to 0.99.7 and explain some of the fixes. It is available for download immediately on the Core Temp homepage. New: Clock modulation detection for Intel processors. Fix: Reading and logging intervals in Settings can’t be changed. Fix: Minor Intel processor recognition issues. Fix: On some systems the System Information window would flood the screen with errors. Fix: G15 plugin restarts after resuming from sleep even if it was previously disabled from the menu. New: Support for the E3000 Celeron series. Update: Rearranged the main GUI and added new information. Update: Added missing Intel Socket names. First and foremost: the Intel frequency detection bug. From all the tests that I have performed everything is now working correctly. Core Temp now implements a completely reworked algorithm to calculate processor frequency on Intel processors starting with Core 2 CPUs. Core Temp polls the CPU 20 times a second and calculates the average clock speed over the course of this second, then uses the FSB speed to calculate the multiplier. Since the processor may transition between power states very quickly and many times a second, you may see jumps in frequency and multipliers that the CPU may not actually have support for. You will probably notice the frequency to be less “stable” compared to older Core Temp versions or other software. The third fix in the list concerns with the Read Interval and Log Interval fields in the Settings window. This is where you adjust how often Core Temp updates its main window (read) and how often it logs the readings to a file (logging, if enabled). For several versions this bug existed and I couldn’t find its source. There were ways to work around it, like editing the CoreTemp.ini file manually or pasting a new value into the field. I’ve tracked the problem down and eliminated it, so now everything is back to normal again. The other fixes are minor, and self explanatory. Core Temp’s main window layout was rearranged, and now includes two new fields: “Lithography” and “Clock modulation”. Lithography is self explanatory: it displays the size of the manufacturing process of the CPU such as 45 nm, 65 nm or 32 nm. Clock modulation – currently supported only on Intel processors – is a feature which lets the processor run at a certain fraction of it’s real frequency. If we take a 3 GHz CPU, running with a clock modulation of 50%, we effectively have a 1.5 GHz CPU. This is often used to cut down on processor power consumption and temperature. Temperature. The range is from 0 – TjMax value for Intel and 0 – 100 for AMD processors. The color of the progress bar will change as the temperature increases: to yellow and then to red if it reaches critical temperature. Frequency. The range is from 0 – current maximum frequency. 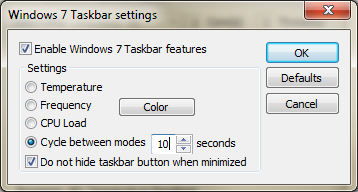 You can manually select the color of the progress bar for this setting. CPU Load. The range is from 0 – 100%. 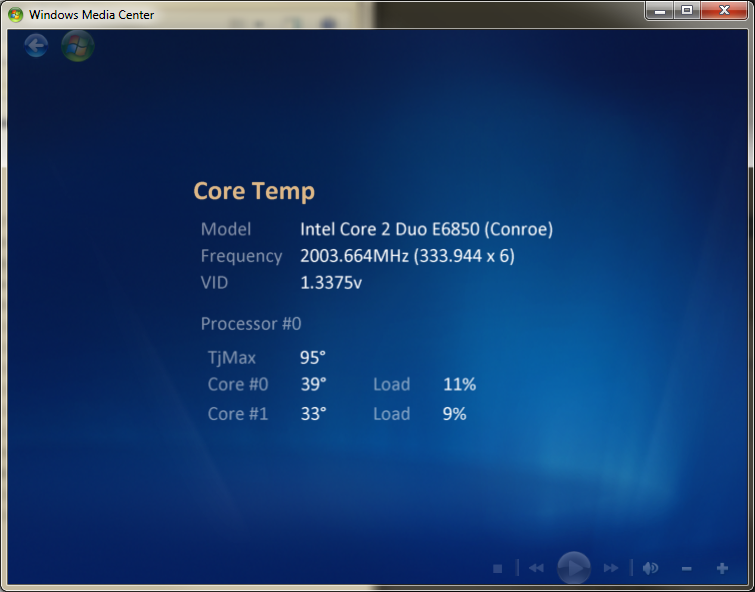 It displays the load of the processor as a whole and not individual cores. The color changes to yellow at 60% and to red at 85%. Cycle between modes. This setting will have the icon cycle between the above mentioned modes at an interval the user selects, between 10 and 600 seconds. The “Do not hide taskbar button when minimized” checkbox determines whether the taskbar button should be hidden when you minimize Core Temp (like it usually is) or be displayed to show the status in the taskbar. There are also other minor bug fixes, as usual. I really hope to get your feedback on this release. You can download the new version at the usual location, Core Temp’s home page. I have also released a media center add-on to enable HTPC users to monitor their processor status from within Media Center, you can download it from the Add-ons page. Actually, I'm working on adding Start with windows support for Vista and Win7.